I wish I could claim this sandwich invention as my own, but I have to give credit where credit is due. And all the credit in the world goes to Tracey Bloom for this delicious creation. 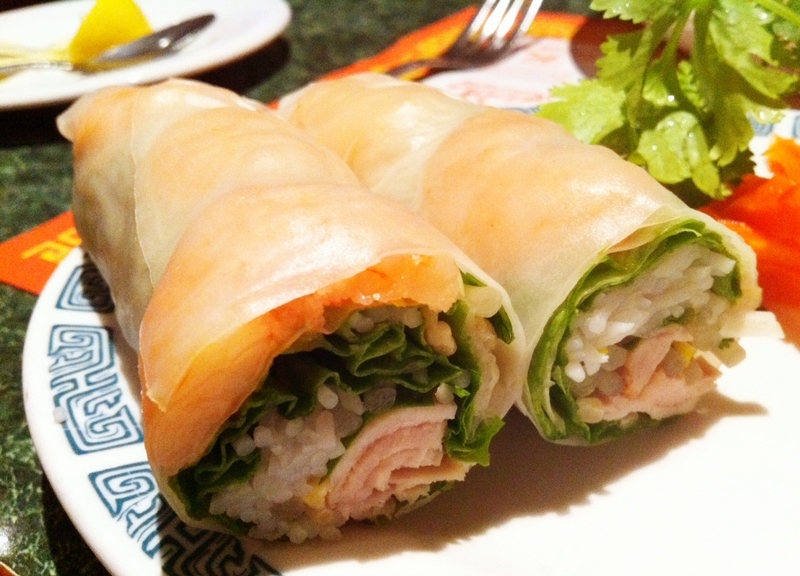 This is such a great twist on an American favorite and a Vietnamese favorite. I may have to try and convince a local Vietnamese eatery to put this on the menu. In a large skillet, over medium-high heat, saute ground beef and onions. When ground beef is about half-cooked, add the rest of the Sloppy Joe ingredients and let simmer for 15 minutes. Spoon Sloppy Joe mixture into French bread (or another bread) and garnish with remaining fresh ingredients. You may recognize Tracey from season 7 of Bravo’s Top Chef. Tracey lives in Atlanta, but I was lucky enough to get to know her at last year’s ACS Hope Gala where she made an awesome shrimp ceviche on a fried plaintain chip. She’ll be back again this year so email me if you’re interested in tickets. 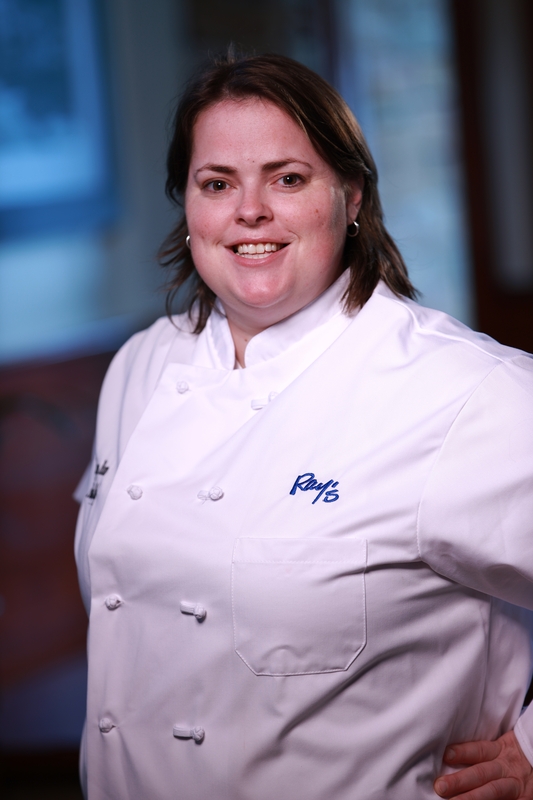 If you want to read more recipes and food tips from Tracey, be sure and check out her articles on NorthFulton.com here. And if you have questions for her, leave them in the comments section and I will get her to answer them. 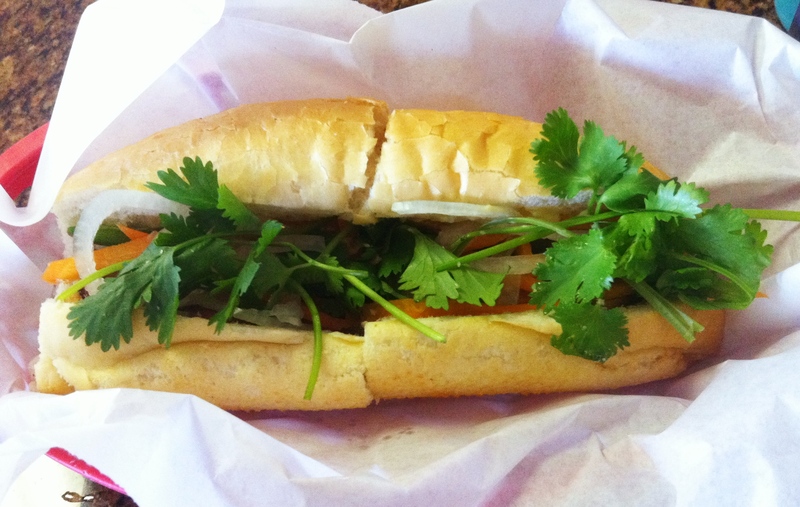 With apologies to 99% of the delis in America, the best sandwiches out there are Vietnamese-style banh mis. They’re loaded with fresh veggies, herbs and meat plus a spicy blast of sriracha. The traditional variety of banh mis have pate, but I didn’t have any so I made a more Americanized version. I also combined the Sriracha with the mayonnaise to make a single spread. In a small bowl, combine mayo and sriracha, mixing well. In a small skillet, heat olive oil and vinegar over medium heat. 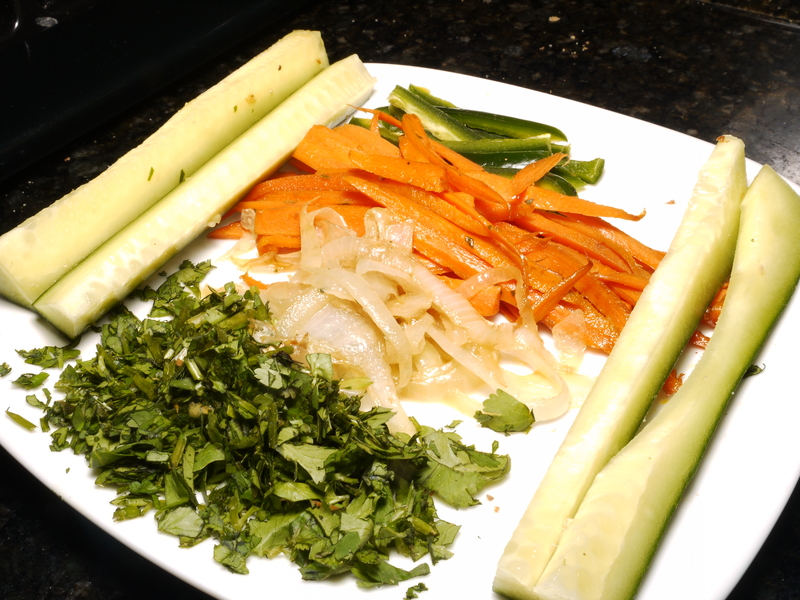 Saute carrots and onions for until carrots are darkened, but not soggy and onions are translucent. Set aside. Slice open baguettes horizontally, but do not slice all the way through. Spread Sriracha mayo on top and bottom halves of baguettes. 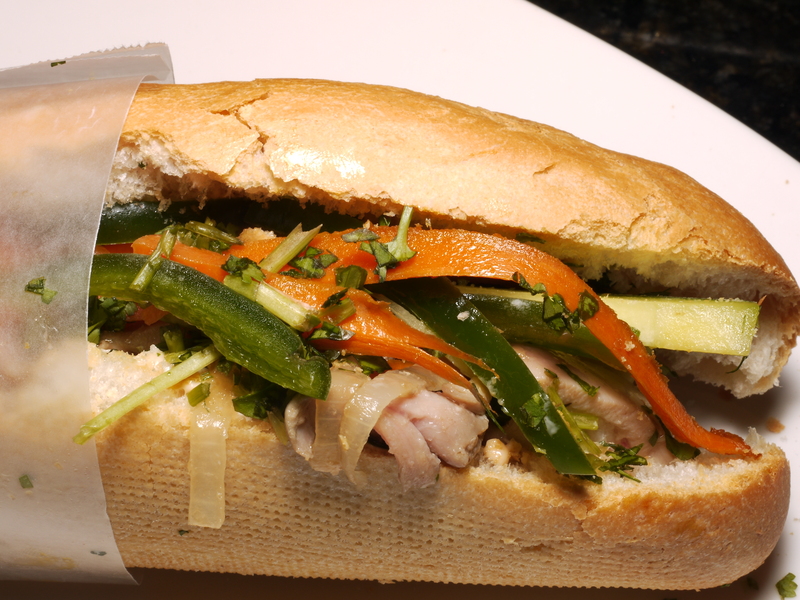 Place chicken equally on both baguettes then layer evenly with carrots, onions, jalapeños and cucumbers. Finally, top each sandwich with fresh cilantro. Close the sandwiches and serve. 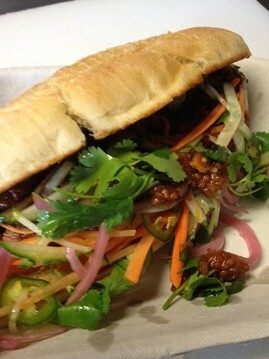 These sandwiches aren’t 100% up to par with what you’ll find in most Vietnamese bakeries, but they will do in a pinch. Thankfully, they aren’t time-intensive at all. Hopefully you’ll enjoy the freshness of the veggies and herbs as a change-up to the typical sandwiches you find out there. You can also substitute the meat of your choice in place of the chicken thigh meat. Great Vietnamese food isn’t hard to come by in New Orleans, especially on the Westbank. While it took me at least two years to fully discover the Vietnamese restaurant scene, it’s become some of my favorite cuisine. I love the freshness of the ingredients used, the complex combinations of ingredients that create the perfect balance of spicy, cool and crunchy. Another plus is not feeling like you’ve just inhaled the food equivalent of a bus the way some other cuisines do. 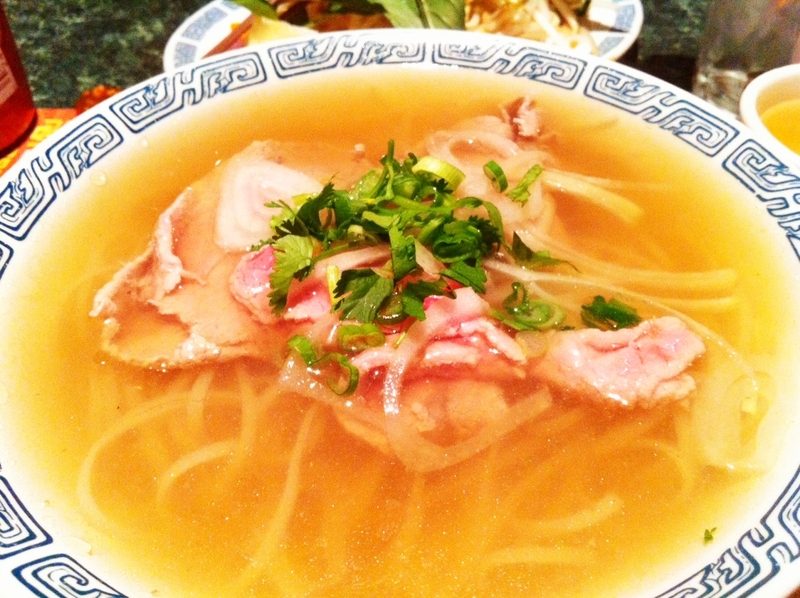 One of the best places for Vietnamese in the city is Pho Tau Bay. While it may not be as traditional as some of the other Vietnamese restaurants in the city, it’s definitely one of the most convenient. While I think there is better pho and better banh mis in the city, Pho Tau Bay overall offers a great menu that’s affordable, delicious and quick. They definitely have the best Vietnamese egg rolls in the city. Nothing I’ve had elsewhere even comes close. In fact, I usually order them as an appetizer (to share if I’m feeling generous) and I add them in a vermicelli bowl if that’s what I order. The companion nuoc mam sauce really sends them over the top. 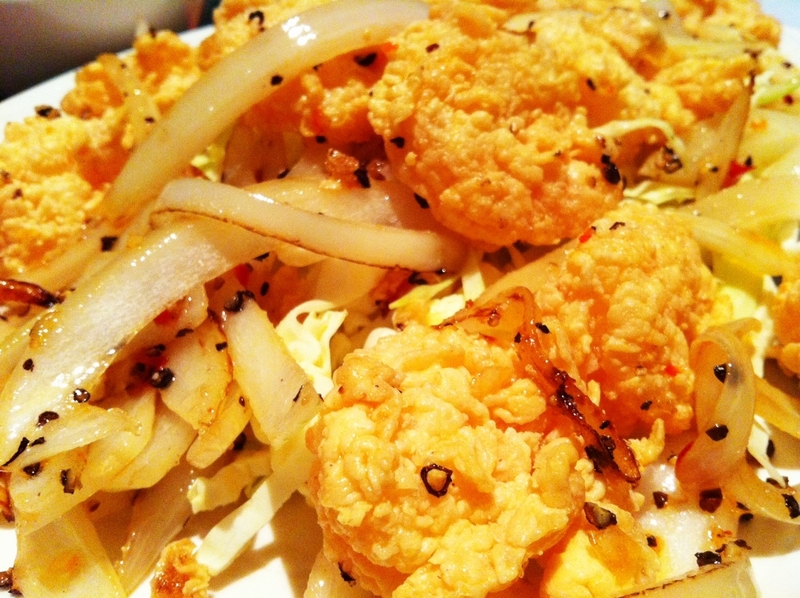 The wrapper is crispy, but not crunchy and the filling is always fresh and complex in flavor. 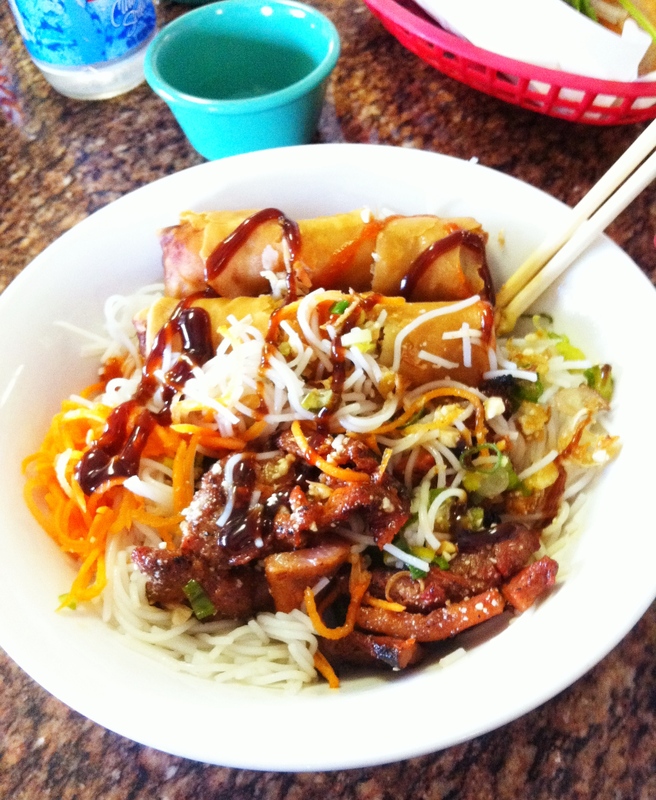 After chowing down on the eggrolls, I normally go with one of the vermicelli bowls. While it’s a nice size portion, you can upgrade to a large for only a dollar more. Filled with noodles, lettuce, cucumbers, fried shallots, carrots and meat of your choice, the bowls make for a great lunch or dinner. While I don’t know the ins and outs of the nutrition facts, I can’t imagine them being nutritionally void. While I’m not crazy about Pho Tau Bay’s banh mis, they’ll do in a pinch. The bread is good, the meat is good, but the pate and jalapeno on traditional banh mis are missing so they don’t quite stack up to other banh mis in the city. The pho is great at Pho Tau Bay as is the PTB wonton soup. The broth at Pho Tau Bay doesn’t feel overly salt and isn’t as greasy as other broths I’ve had. The herb basket that come with the pho is also one of the most generous in the city. I always feel guilty not using every leaf of basil, every bean sprout, every slice of cucumber and every jalapeno. To wash it all down, I highly recommend the soda chanh (club soda with lime juice and sugar). It’s always refreshing, isn’t packed with sugar and has a great tart/fizz combo to it. Overall, Pho Tau Bay offers inexpensive, quality, fresh Vietnamese food in a hurry. It’s one of the best places to go on the Westbank. So if you ever get the urge to venture across the Crescent City Connection, be sure and stop in for some of the best Vietnamese around. Pho Tau Bay is located at 113 Westbank Expressway (take the Stumpf exit). Hours: Mon.-Wed., Fri.-Sat. 9 a.m. to 8:30 p.m.